The Maruti Ertiga is over five years old now and will reach the end of its lifecycle next year. The second-gen Maruti Ertiga is expected to arrive sometime next year. The 2018 Maruti Ertiga should have a more youtfhful design insipred by the 2018 Maruti Swift. A source familiar with the next-gen Maruti Ertiga's progress has told Otomania.com that the debut will take place next year. The plan is to introduce the new generation model in the first half of the year itself. Donny Saputra, Deputy Automobile Marketing Head, PT Suzuki Indomobil Sales, has also confirmed to the publication that an all-new Ertiga is planned. The Ertiga is originally a Maruti Suzuki model. It was launched in India first, and then in Indonesia and other markets. The latest report suggests that the next-gen Ertiga, however, will go on sale in Indonesia first. 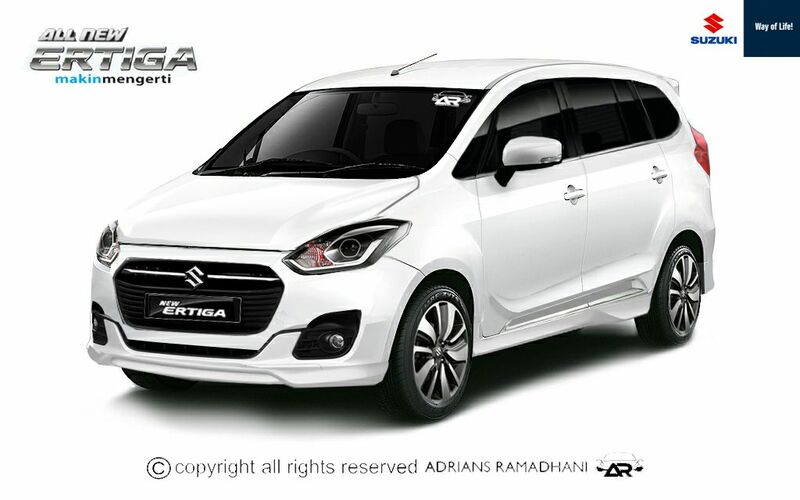 The next-gen Ertiga would share the HEARTECT platform with the new generation Swift. The new platform is 30 kg lighter than that of the old model currently on sale in India, and that, along with other weight savings measures, has made the Swift up to 120 kg lighter. The second-gen Ertiga too could weigh significantly lighter than the old model which tips the scales currently at 1,135-1,265 kg varying as per the configuration. The 2018 Maruti Ertiga should have a more youthful design inspired by the 2018 Maruti Swift, as depicted in the rendering (above) by Indonesian digimod artist Adrians Ramadhani. The current model is available with the K14B 1.4-litre petrol engine and the D13A 1.3-litre DDiS engine. The latter will go out of production by 2020. A new 1.5-litre diesel engine developed in-house will likely replace it. Maruti Suzuki has successfully tested the new engine in the Ciaz. The company could offer it in the 2018 Maruti Ertiga right from the launch. As for the K14B petrol engine's continuation, no details are available yet. The next-gen Ertiga would share the HEARTECT platform with the new generation Swift. Also See: Will the next-gen 2018 Maruti Ertiga turn out this sporty? Following an international release in the first half of 2018, the next-gen Maruti Ertiga could arrive in India in the second half of the year, perhaps around the festive season in the fourth quarter.